Not all binge watching is created equal. Some shows give you that “one more episode” feeling The Pros and Cons of Binge-Watching Television The Pros and Cons of Binge-Watching Television Binge-watching is a recent phenomenon that pretty much everybody has done thanks to Netflix, Hulu, and Amazon Prime. But for all of its various pros, it does also have some cons. Read More while others make you stop after each episode and absorb what you just saw. 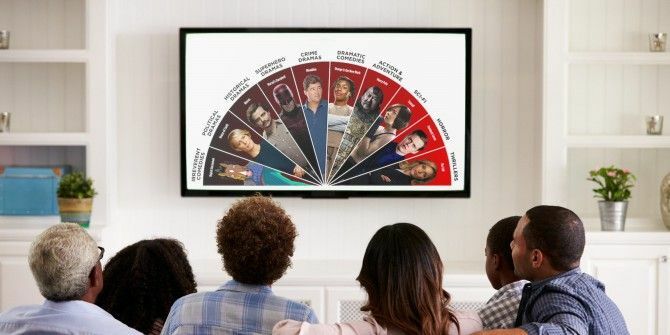 No one know this better than Netflix How to Find Out Your True Netflix Video Streaming Speed How to Find Out Your True Netflix Video Streaming Speed Internet speed tests tend to be inaccurate because ISPs throttle Netflix. Want to know your true Netflix speed? Use this website instead. Read More . 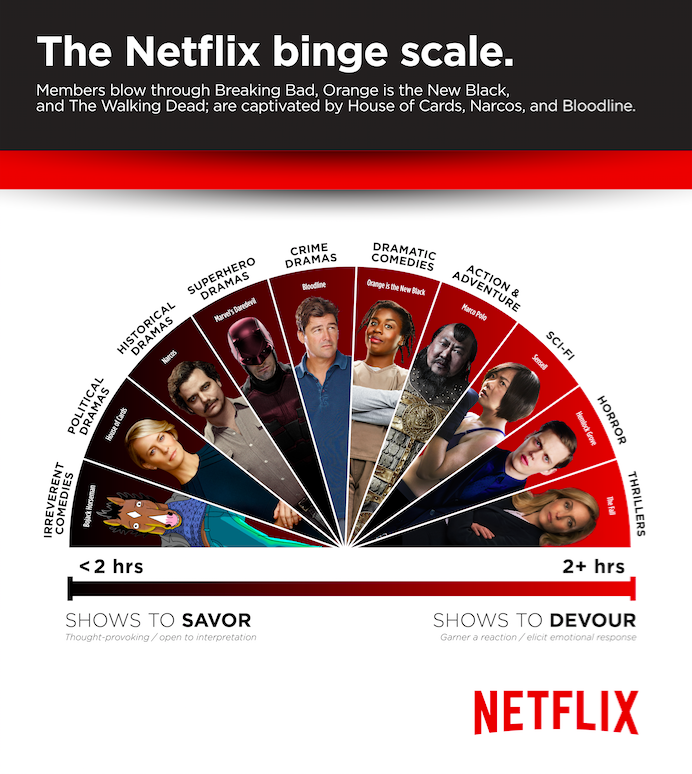 With its millions of users, it was able to create a cool new page called The Binge Scale. Basically, what Netflix did was dig through the global viewing patterns of more than 100 TV series 4 TV Shows That Get Artificial Intelligence Right 4 TV Shows That Get Artificial Intelligence Right Fictional depictions of artificial intelligence have rarely been realistic. Fortunately, we're starting to see a change on television, and the resulting shows have been phenomenal as a result. Read More across more than 190 countries to determine how users watched them. It found that certain shows caused viewers to want to finish them quickly, meaning they watched over two hours a day. Other shows were binge watched at a slower pace with users watching under two hours a day. Obviously, there will be exceptions, and you might find that certain parts of the scale don’t agree with your tastes, but this simple image serves as a solid baseline to help you choose what sort of show you want to watch This New Chatbot Helps You to Find More Movies to Watch This New Chatbot Helps You to Find More Movies to Watch Need a quick recommendation on a movie that you can stream over services like Netflix and Hulu? This new chatbot is an easy way to get one. Read More . Staying home from work for a week after a surgery stuck in bed? Perhaps something from the right side is what you need. Working 12 hours days and want to watch just one episode before bed each day? A genre from the left might be perfect for you. Do you like to binge watch TV shows? Do you tend to go with the “one more” type of show, or the more thought-provoking options? Let us know in the comments! It would be great if I could actually see that scale. Can’t even make out the show titles while reading this article on my iPhone.